What if you have a decommissioned metal pipeline near your location that is much longer than 17430 meters? It there any way to tap into VLMOs (very long metal objects) to use as VLF antenna? I’m in the southern hemisphere and the pipe runs mostly east west for the greater part of it’s length. Are there any non contact ways of tapping into such a VLMO using coils? Not so sure, it is insulated and VLF behaves differently doesn’t it, the ground dipole effect? How do the undersea, down to 20 meters depth, systems work? Undersea RF communications takes advantage of skin depth. Most of us are familiar with the effects of skin depth at high frequencies, where it’s usually considered a BAAAD thing because almost all of the RF current is very close to the surface of a conductor – like a fraction of a millimeter – causing increased losses. But at very low (and lower) frequencies, the RF current penetrates deeply enough – even in conductive seawater – to be easily detected without exposing the antenna to air, where IT can be easily detected. Wikipedia provides the formula here: https://en.wikipedia.org/wiki/Skin_effect. Note that skin depth is roughly inversely proportional to the square root of frequency, so each decade reduction in frequency gives you a three-fold increase in skin depth. Also note that all other things being equal, skin depth is roughly proportional to the square root of the resistivity of the conductor involved, so seawater, being much more resistive than copper, allows significant penetration. A limitation of all long-wire antennas close to the ground (relative to the wavelength) is that the closer to the ground they are, the higher the angle of the antenna pattern is, so at VLF, this would put the pattern very close to vertical. Just the same, it should still have some sensitivity left even at low angles. As for non-contact coupling, yes, you could just place a wire parallel to the pipeline, as long and as close to the pipe as you can manage, connect one end of that to your radio and the other end to ground, which would give you some amount of inductive coupling. The best answer is the one you tell us after you have tried it! If I tell anyone it will be via hellschreiber messages in “Dreamer’s Band”, so you personally will never know. I’m pretty sure it could be powered by steam. In fact, it probably was, originally. Is it possible to make small, low power Alexanderson alternators? Just kidding. I sure hope so! This went way past my knowledge of old tech. Of course it is possible. An Alexanderson alternator is nothing more than a variable-reluctance device (similar to an electric guitar pickup) with many poles. The amount of power output is limited by both the alternator design (output voltage and source impedance) and the impedance of the load. If you want lower power, either lower the voltage or raise the impedance. Power is then calculated using P = E^2 / R, or E = sqr(P * R) where E is the RMS voltage of the alternator and R is the total impedance (source + load). So if you want to drive 5 watts through a 50 ohm antenna with a 50 ohm source impedance, you get E = sqr( 5 * (50 + 50) ) = 22.3 V. Since the rotating speed is set by the desired frequency and the number of poles (number of slots on an Alexanderson alternator rotor), E is determined by the number of turns of wire on the poles and the strength of the magnetic field. It is possible to calculate this if you know all of the factors, like the air gaps between the rotor and the pickup poles, but it’s simpler to just use trial-and-error. Source R also depends on the number of turns and the wire gauge. If you use a field coil rather than a permanent magnet bias, you can adjust the power output by adjusting the field current. Another advantage of using a field coil is that you can use this to AM modulate the output. Once the alternator’s windings are fixed, you can also change the output power by using a matching transformer to either raise or lower the voltage to the antenna. You can also use some series resistance between the alternator and the antenna to limit power, but this reduces efficiency. The Wikipedia article https://en.wikipedia.org/wiki/Alexanderson_alternator “See also” section notes that the tone wheel mechanism used on Hammond organs operates similarly. For low-power applications, this might be something to try, since it is mechanically simpler than a “real” Alexanderson alternator. Keep in mind that the output frequency either way is equal to number of slots or teeth * RPM / 60, so for a 20,000 RPM rotor (333 RPS), 1000 teeth or slots gets you 333 KHz. While this is really not the same thing as an Alexanderson alternator, we DO have something that already exists that can generate AC power and has a large number of poles: stepper motors! Trying to drive one of these at 20,000 RPM or more would be a bit of a challenge, though. Holy steampunk! With no active (semiconductor or vacuum tube) components! That’s way beyond what I would try – saturating reactor balanced mixer? Wow. It DOES get him effective frequency doubling, though. For those who didn’t look at the link, this is a VLF direct-conversion RECEIVER for listening to SAQ broadcasts using a motor-driven stepper motor as the local oscillator. Because what’s more practical than an scratch-building an electromechanical radio receiver that can be used for a few hours every year? Ooh – and one more thing: single-sideband modulation and demodulation can be done using a Weaver modulator, which can be a little tricky to implement because it requires two local oscillator signals, 90 degrees out of phase. But guess what? Stepper motors used as generators have outputs that just happen to be 90 degrees out of phase with each other. Too bad the lowest amateur bands are at 1.8-2.0 MHz. Actually, there are new allocations in the MF and LF bands, 600m (472-479 kHz) and 2200m (135.7-137.8 kHz) respectively. You could maybe build an electromechanical TX for 2200m, but the bigger problem is getting any kind of useful signal out of your antenna system. 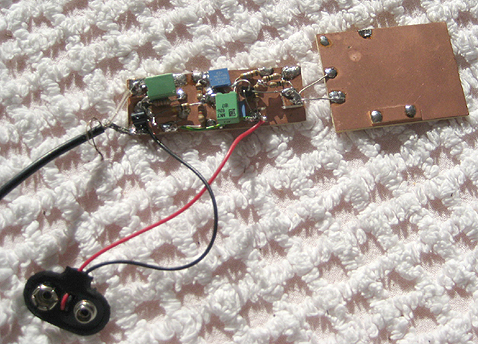 Down in the VLF range it must be a nightmare to build an antenna that doesn’t just turn all your RF energy into heat. Not in the US. The 600m band requires/required a special experimenter’s license (Not sure if they’re still licensing anyone for this band or not), and the 2200m band is simply not allowed, AFIK. I have no idea why the FCC is so protective of these frequencies, but sadly they are. Perhaps this has changed since I last looked into it, so please ignore me if that is the case. I would agree that BLDC motors would be easier to drive, BUT, since frequency = number of poles * RPM/60, using BLDC motors would severely limit your top frequency. Even at 30,000 RPM, which is 500 revs/second, you only get 500 Hz per pole pair, which means that even a 12-pole motor would only get you 3000 Hz. Oops – that’s frequency = number of pole pairs * RPM/60. This would only be a small variation on the Alexanderson alternator – you’d just be putting the magnets into the slots in the rotor instead of biasing the stator with them. Good luck getting those to stay in place at 100k RPM. The genius of the Alexanderson machine was in having the rotor simple and putting most of the complexity in the stationary frame. Remember that HAD article not long ago about programmable magnets? You can generate a multitude of poles around the edge of a perfectly smooth disk. You can even float it in a vacuum on magnetic bearings, the trick is how to push one part of it at a much lower frequency to allow you to induce a higher frequency on the output edge. But the principle is basically the same as for gear boxes and tone wheels, except there is no friction and the speeds are only limited by the g forces the disk material can handle before failing catastrophically. Yes, I was reminded of that when salec mentioned a disc plate with a magnetic pattern printed on it. This would be mechanically superior to having to physically attach discrete magnets to the rotor, so yeah, a really high-speed rotor could be made that might not self-destruct. I wonder if anyone here as any insight into how an electromechanical oscillator like this would compare with electronic ones in the areas of phase noise and residual FM. Of course you could phase lock it to a reference, but that would seem like cheating since it would require an electronic oscillator to lock it to. Unlesssss… you could electromechanically phase lock it to a pendulum? Or a tuning fork? In Alexanderson transmitters, there was a closed-loop electromechanical feedback system for controlling the frequency (see the Wikipedia article), so this isn’t completely out of the question. Well the entire thread in this discussion is actually a bit stupid and pointless as there is no reason to do it. The Alexanderson device was made because there were no better options at that time for the required power output. We now know how to make far more sensitive receivers so not even the output power is required. We also have digital logic knowledge so we can use a mesh to cover greater areas and put our information into packets that are routed. We just know so much more basic theory these days that even with equally low technology we can do far more than the engineers could back then. Maybe, perhaps by using a disk plate with alternating magnetic pattern as a many-pole rotor. But it is a sort of cheating – they couldn’t make good neither ferromagnetic coating nor miniature mechanical features needed for r/w heads back then. I’d like to try your extended version of the SAQrx since i’ve been listening SAQ transmissions for years now. I always wanted to have a filter smaller than 300Hz . Can i find your extended version somewhere on the web. Wow! I bought one of everything! JK No more spam please, or did you post the wrong link? I will strongly recommend that you go and visit Grimeton if you are in the neighborhood of Varberg in Sweden. It is such a nice museum. I have a cottage some 50 minutes from it, and I visit it at least once a year. Nice smell of oil, very unusual for radio transmitter installations :-) As far as I can judge, the Alexanderson transmitter was already outdated when it was installed in 1924. At that time the “Poulsen Arc” (pat. 1903) had been active for several years; e.g. the 1 MW U.S.Navy transmitter from 1918. In the 1920’s the first vacuum tubes took over. But still, the Alexanderson is a fine piece of “steam punk”, as taken right out of a Frankenstein movie. Arc transmitters were very dirty compared with alternators. The main thing that killed the Alexanderson was its inability to scale to higher frequencies. With radio becoming more and more popular, the only way to go was up in frequency. Vacuum tubes made this possible.